Pikeville Medical Center Home Health is medically-directed nursing and support care. It’s provided in the patient’s home by a team of professionals that include the patient’s physician and the home service staff. Home health care often allows the patient to leave the hospital sooner or avoid hospitalization in certain situations. The type and frequency of care or service a patient will receive is based on the individual’s health care needs, in accordance with the physician’s care plan (and, as applicable, the insurance company’s coverage allowances). The staff will discuss the patient’s planned care and schedule a meeting with the patient and caregiver, encouraging them to participate in the care planning process. 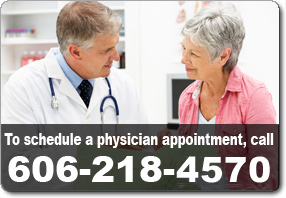 Every reasonable effort will be made to adjust the home health visit schedule to the patient’s convenience. Registered nurses (RN) or licensed practical nurses (LPN) assess, manage and monitor the needs of patients. These specialized services help patients develop or regain lost abilities and independence, while learning to function again in their own environments. A medical social worker helps the patient and family to identify social, emotional or economic needs. They also provide counseling and assistance to meet those needs. PMC Home Health aides are competently trained paraprofessionals who provide patient care, under the supervision of a registered nurse or therapist, as directed on the patient’s plan of care. Aides perform hands-on patient care and meet their patients’ hygiene needs. For clients needing prescription equipment, the client must be under the care of a physician. The client’s physician must order the equipment. The client and/or family must desire home care equipment and provide a written signature of acceptance upon delivery. The client must reside within the geographical area the company services. The physical facilities and equipment in the client’s home must be adequate for safe, effective care. Services and care must conform to current standards of practice for the respective discipline. Acceptance for equipment is based on the client’s willingness and ability to function in a non-institutional environment. Family support or assistance is required for a child, clients who are unable to manage their care or with certain equipment (for example, a ventilator). Goals for care are met and no further skilled service is needed. The patient requires another level of care. The patient moves from the agency’s service area. The patient or responsible person refuses the agency’s service. The patient or family requests transfer to another home care provider. A change in the status of the Home Health agency occurs, which prevents it from continuing the service. There are personnel safety issues which jeopardize the health and well-being of agency staff, and cannot be resolved. The patient or family does not comply with the agency’s requirements or physician’s plan of care. This may result in the physician ceasing to provide pertinent orders for treating the patient’s health condition, therefore making skilled visits unnecessary and unreasonable. Patients are informed in advance of any anticipated plans by the agency for discharge from the Home Health program, or any of the services or disciplines, and are provided with the reason for the decision.